The last weekend of July, the streets of Poggio Moiano will be filled with beautiful and colorful carpets of flowers! 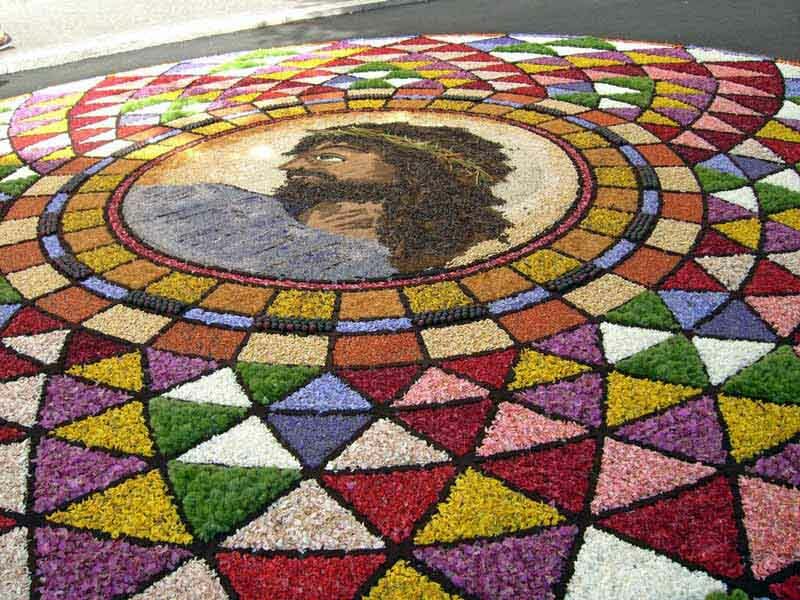 This tradition was born with Poggio Moiano’s community itself, randomly casting the petals of flowers to honour the passing of the Sacred Heart of Jesus, in early July, on the occasion of the Christian feast of Corpus Christi. Today the religious sentiment still pushes all the inhabitants of the country to continue the tradition of composing floral paintings and then give free passage to the solemn procession that will destroy the work of months of effort. After centuries, the techniques have been refined to achieve a high artistic level and the amazing beauty of the compositions. There is no “Poggiomoianese” who is not involved in this event, not only as “infioratore”, but also in the phase of preparation, such as the collection, “piluccamento”, drying and milling the flowers. Today the Infiorata (Flower Festival) calls visitors and artists from many parts of Italy, engaging themselves in the production of colourful carpets together with the inhabitants of the village.